The Park Prep Academy foreign language program is currently led by native Spanish-speaker Saily Vega (“Miss Saily”) and Jocelyn Greenwald (“Miss Jocelyn”). The language of study is Spanish. Spanish class is held two afternoons per week for thirty minutes and is infused throughout the daily life at Park Prep Academy. Throughout the year, students learn Spanish vocabulary, expressions, and songs in a fun and interactive way. Activities such as hopscotch counting in Spanish and games like “Guess the Animal (Animale)” make the Park Prep Academy Foreign Language program exciting and engaging. 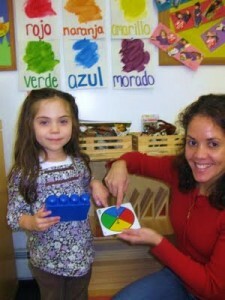 Emphasis is placed on the acquisition of language and also fostering a willingness within each student to participate. At the culmination of the school year, each student makes a Spanish Book “Mi Libro de Espanol” which is a compilation of each his/her work in Spanish class throughout the year. Parents are encouraged to utilize their child’s daily note, the PPA blog, and also “El Libro de Espanol” to help support and encourage their child’s language development. In the upcoming years, Park Prep Academy plans to expand the foreign language program to include some of the following languages: Mandarin (Chinese), French, German, and Arabic.